Jahana Hayes is Connecticut’s newest delegate to the U.S. House of Representatives. 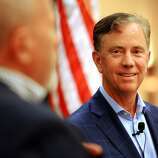 It took nearly 10 hours after the polls closed for Connecticut voters to learn who won the hard-fought race for governor, and by the time Ned Lamont was named the next governor, voters were beginning a new day. It’s not the first time election results have been delayed — Connecticut’s cities have developed a reputation for holding up the process — but with a broader majority in the state Legislature, Secretary of the State Denise Merrill hopes changes in the state’s voting laws could be on the horizon. Merrill plans to again propose a change to allow early voting, as well as create no-excuses absentee voting. She also plans to propose automatic registration for 16-year-olds, who could be registered when they visit the state Department of Motor Vehicles for their learners permits. Thirty-three states and the District of Columbia allow early voting in person, which cuts down lines on Election Day, especially in highly populated cities, and helps results come in faster. A record 36 million people across the nation voted ahead of Election Day. Cheri Quickmire, executive director for Common Cause in Connecticut, said she would like to see early voting as well as expanded automatic voter registration. Long lines for Election Day registration in New Haven created confusion when hundreds of people were still in line past the 8 p.m. deadline to register. The biggest problem, Quickmire said, was understaffed polling places and registration lines. He said looking at ways to streamline and add consistency to polling practices in Connecticut’s cities and towns will be a focus of the Secretary of the State’s office. 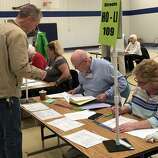 In many states, voting practices are handled by regional county governments. But in Connecticut, which has no county government, all 169 towns and cities are responsible for their own elections. To further complicate matters, every town has two — sometimes three — registrars. That’s well over 330 election officials, each with the authority to run elections as they see fit. Unsurprisingly, that causes problems, Rosenberg said. The only way to change Connecticut’s voting practices is through a constitutional amendment that would allow early voting and eliminate the restrictions on absentee voting, a measure that has failed in Connecticut. In the past two legislative sessions, bills that would addressed early voting passed the House but were never called for a vote in the Senate, which was tied 18-18. Now, with a greater majority in both chambers, it’s likely voters will see an early voting question on the ballot.